This was the third large hotel to burn within eighteen months at Pass Christian. Lynne Castle and the New Magnolia being the other two. Their combined loss value was estimated at $300,000 in the early 1900s. The Mexican Gulf Hotel Company of Pass Christian was organized in 1882 with an authorized capital of $35,000. The president was Gen. George Sherman with George P. Brandt as secretary. Work began on October 2, 1882. Before the building was half-finished it was found that the cost would be far in excess of the subscribed capital stock. The final cost was about $105,000. Doors were opened to guests on June 16th, 1883, with Matthew J. Crawford as manager. It was the first hotel on the Gulf Coast that was specifically designed to attract winter guests from northern states. 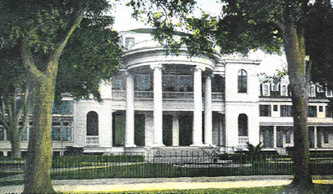 The original structure was built in Colonial style with covered verandas and observatories overlooking the Gulf of Mexico. The 3-story building faced Davis Avenue having been designed without inside rooms, with the result that every room shared direct sunshine. A private pier extended out from the hotel property into the Gulf. It was a spacious-covered structure, provided seating where hotel guests could enjoy taking breaths of the salt air while watching the many and varied boats in the Sound. Through its beginning years, the outstanding indebtedness quickly began to cause trouble to its owners who almost from the start, had defaulted on the bond interest. They were brought to court and eventually foreclosed upon and taken over by Frank Howard as agent. The Stockholders then leased the hotel to the hotel manager, M.J. Crawford, who also struggled along until he spent all of his money. He too was finally forced out by his creditors in 1887. At that time the only heat in the building was five base burner stoves and grates in the bed rooms. The water supply was from a well on the beach lot from which the water was pumped into cisterns at the rear of the buildings. 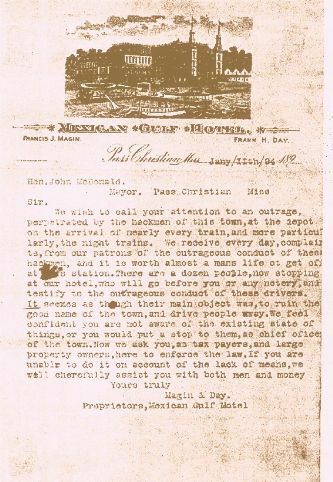 Comments by Crawford were stated as, “When the hotel was completed, instead of facing the Gulf, it offered a small front that was only two rooms deep overlooking the water. Naturally, everyone stopping at the hotel wanted a front room – but there were only four front rooms having a view of the Gulf. “Another problem was epidemics of whooping cough followed by the many rumors of Yellow Fever which would cause everybody to scamper to their homes to escape being quarantined. It was no joking matter to be left inside the quarantine lines. Every little hamlet established what they were pleased to call a "gunshot quarantine," and if one approached the lines with the intention to cross them, he was promptly ordered to return, or else he would be shot "full of holes." “I struggled through six years and was then forced against my will by the sheriff to return to New York. My exit was hastened by this official having had a judgement placed in his hands against me, and some of my friends having told me of this man's ways of collecting bad debts, I kissed my hand to Pass Christian and left it to its fate." Following Crawford was with a gentleman named Blake who was fortunate with a good season and actually made money. In 1902, Magin and Day of Chicago, bought the property and sold an interest to S.F. Heaslip who afterward bought out Magin and Day. Samuel Heaslip served several terms as mayor of Pass Christian and is remembered for having reorganized and spearheaded the formation of the current Pass Christian Yacht Club. Heaslip renovated the hotel extensively and provided lighting and heating to the 250 guest rooms and chambers. The beautiful dining room was one of its greatest features, which was lighted on three sides by long French windows that reached from the floor almost to the ceiling. He too, was unsuccessful and tired of the business sold to Dickerson of Chicago, who remodeled the house and built an addition to the east wing. Dickerson then leased to Gage Clark, who soon retired and leased to a former administrative employee of the hotel, Bernard Chotard, who also unsuccessfully leased the hotel. Albert Aschaffenburg was the last hotelier to invest in the hotel. He brought together a group of investors from New Orleans. They bought and remodeled the Mexican Gulf Hotel in 1916, only for it to burn down on January 8, 1917. At that time, there still was no firefighting equipment in Pass Christian. The Gulfport fire engine was called and reached the scene in about 40 minutes, but due to low water pressure, it was unable to perform. An engine from Biloxi also responded to the call, but before its arrival the walls of the massive building fell down. A large number of firemen from Bay St. Louis walked across the three-mile railroad trestle since there was no automobile bridge at that time. Meanwhile, from Long Beach, Gulfport, Biloxi, DeLisle, and Cuevas, large numbers of people were attracted by the flames that lit up the heavens. Needless to say, in the following year firefighting equipment was added to the volunteer "Bucket Brigade". The Mexican Gulf Hotel Company of Pass Christian was organized in 1882, by Gen. George Sherman and other stock holders having an authorized capital of $35,000. Before the building was half-finished it was discovered that the cost would be far in excess of the subscribed capital stock. total cost of construction was approximately $105,000. Its doors opened to guests on June 16, 1883, with M. J. Crawford of New York, as manager. With the opening of the Gulf Ship Island Railroad between Chicago and Gulfport having been completed, the Mexican Gulf was the first hotel on the Gulf Coast that was specifically designed to attract winter guests from northern states. The hotel was constructed in the Colonial style of architecture with covered verandas and observatories overlooking the Gulf of Mexico. The three-story structure faced Davis Avenue, having 250 guest rooms equipped with hot and cold water, telephones, and all modern conveniences including private baths which were arranged singly and en suite. The building was steam heated throughout and had an elevator providing access to the upper floors. It was designed without interior rooms thereby allowing every room to share direct sunshine. surrounded by boats of all kinds. Through its beginning years, the outstanding indebtedness began to cause trouble. The company defaulted on the bond interest and was brought to court — and was eventually foreclosed upon. The stockholders, led by Frank Howard, leased the hotel to Crawford, who also struggled along until he spent all of his money and was finally forced out by creditors in 1887. Matthew J. Crawford, a fine writer of his memoirs, reported the following account. "Some twenty years or so ago a gentleman of means living in Pass Christian on the Gulf Coast of Mississippi conceived the idea of building a hotel at that charming spot. To this end he engaged the cooperation of some bankers and cotton merchants of New Orleans in the undertaking. This gentleman was a very pleasant person, and like many pleasant people knew very little about hotel construction and the manner in which it should be conducted when built. He was obstinate in his views and as those who were associated with him knew even less than he did about such matters he was allowed his own way in everything. In consequence, when the hotel was completed, instead of facing the Gulf, it offered but a small front -- two rooms deep overlooking the water. As the house was designed for a summer and winter resort, and as everyone stopping at the hotel wants a front room, the house, when opened, was unable to supply the demand, there being only four front rooms having a view of the Gulf. My reputation having preceded me, such as it was, I was selected to manage it. I left New York for the Sunny South, and upon my arrival took charge of the hostelry. I had many acquaintances and friends in New Orleans, so I felt that I would like to be among them. The house opened early one summer and by July we were fairly under way. The clientele was entirely Southern. Sugar and cotton planters from Louisiana and Mississippi and New Orleans and Mobile families attended by an army of colored servants. The children and servants made up nearly half the house count, and invariably as the summer season came 'round also would appear the whooping cough and then it was a sight to see the "fussed up" manager vainly trying to quarantine the afflicted babies so as to prevent the mothers of the well ones not to depart and leave a lot of vacant rooms on his hands." "We would hardly recover from this plague when we were dismayed by the yellow fever scare. When the first rumors of the fever broke out, everybody scampered to their homes in New Orleans to escape being quarantined. It was no joking matter to be left inside the lines. Every little hamlet established what they were pleased to call a "gunshot quarantine," and if one approached the lines with the intention to cross them, he was promptly ordered to return, or else he would be shot – "full of holes." There never was any yellow fever at the Pass, but there might as well have been – for the real thing could not have been so thrilling as the scare. “I struggled through six years and was then forced against my will by the sheriff to return to New York. My exit was hastened by that official having had a judgement placed in his hands against me, and some of my friends having told me of this man's ways of collecting bad debts, I kissed my hand to Pass Christian and left it to its fate." A former administrative employee of the hotel, Bernard Chotard, then leased the hotel, which was later followed by S.F. Heaslip who took over in 1894. Samuel Heaslip had served several terms as mayor of Pass Christian and is remembered for reorganizing and spearheading the formation of the current Pass Christian Yacht Club, in which he became its first Commodore in 1893. Heaslip renovated the hotel extensively and provided lighting and heating to the 250 guest rooms and chambers. The beautiful dining room was one of its greatest features, which was lighted on three sides by long French windows that reached from the floor almost to the ceiling. During meal times, the tables were crowded with guests as the Black waiters went about silently supplying the many wants. “No pains were spared to obtain all the delicacies of the seasons. There are two enormous fireplaces here on which logs when placed on chilly evenings, throw out a grateful warmth and light, which, reflect on the bright colored carpets and hangings, making the place look cheery and homelike. More than all others it is the favorite resort for Chicago, St. Louis, Cincinnati and other northern and western people, who during the winter months come to the Pass in large numbers." One of these winter vacationers in 1913,was President Woodrow Wilson who dined at the Hotel restaurant while staying at the nearby Dixie White House. At that time, there still was no firefighting equipment in Pass Christian. The Gulfport fire engine was called and reached the scene in about 40 minutes, but due to low water pressure, it was unable to perform. An engine from Biloxi also responded to the call, but before its arrival, the walls of the massive building fell. A large number of firemen from Bay St. Louis walked across the three-mile railroad trestle since there was no automobile bridge at that time. Meanwhile, from Long Beach, Gulfport, Biloxi, Delisle, and Cuevas, large numbers of people were attracted by the flames that lit up the heavens. Needless to say, in the following year, firefighting equipment was added to the volunteer "Bucket Brigade." The Mexican Gulf Hotel was destroyed by fire this afternoon at 8 0'clock, causing the loss of about $100,000. When discovered, the flames had detained such arrest efforts to check them were unavailing. The origin of the fire is a mystery which has not been solve. The flames started in the north end on the third floor and ate their way through until the front was reached. Persons who attempted to reach the portion of the hotel where the flames started were unable to do so owing to the smoke that filled the entire third and second floors. The fire must have burned for some time before discovered, it is thought. At the time, there were thirty or more workmen in the structure and a half dozen women, all of whom were engaged on the ground floor. The structure was insured for $75,000. It was built thirty-three years ago (1883) at a cost of $85,000. Seven years ago (1910), $38,000 more was spent in the construction of a large addition — and within the past three months, $28,000 was spent on interior improvements preparatory to opening the house within the next two weeks. The Mexican Gulf was owned by a recently organized stock company chartered under the laws of Louisiana. The L.L. Dickason estate of Chicago was the largest stockholder, owning about $75,000 of the stock. The remainder was held by New Orleans people among whom are Arthur B. LaCour, president of the company and A. Aschaffenburg, general manager. None of the stockholders are here, but Frank Taylor, late assistant manager of the St. Charles Hotel of New Orleans, and who had just been appointed manager of the Mexican Gulf, was present when the fire occurred. He said he was unable to give any theory of the fire’s origin. At one time, all the buildings on the west side of Davis Avenue (across the street) were in danger, but only the hard work of the bucket brigade saved them. (Along the west side of Davis Avenue) The home of Mrs. F.P. Wittmann was damaged to the extent of almost $800. The residence of Ed Bielenberg and that of Mrs. W. Champlin were also damaged considerably by the heat and water. The two large stores of Elmer Northrop & Company, the postoffice building, and the Cumberland Telephone Company’s office seemed doomed and from many of them all effects were removed. The Gulfport fire engine was called and reached the scene in about forty minutes, but owing to a lack of water pressure, was unable to work. An engine from Biloxi also responded to the call of help, but before its arrival, the walls of the massive building fell. A large number of firemen from Bay St. Louis walked across the thee-mile trestle and from Long Beach, Gulfport, Biloxi, DeLisle, and Cuevas, large numbers of people were attracted by the flames that lit the heavens for miles around. This is the third large hotel to burn within eighteen months at Pass Christian. Lynn Castle and the New Magnolia being the other two. Their combined loss value was estimated at $300,000. The Mexican Gulf Hotel was owned by a local company of which Arthur B. Lacour is the president. The stockholders are Ernest Lee Jahncke, W.B. Gilliean, Robert J. Perkins, W.P. Burke, Percy Stern, R. Frank Taylor– secretary and manager, and W.H. Aschaffenburg – vice-president and treasurer. News of the disaster reached here (at New Orleans) Monday afternoon, hardly four hours after a long distance telephone conversation between R. Frank Taylor and Mr. Aschaffenburg to the effect that work on the hotel was almost completed and a grand season was expected. Mr. Taylor spoke in high praise of the general appearance of the hotel. Many reservations had been made, and the greatest season in the history of the gulf coast was expected. The directors of the company will go to Pass Christian Tuesday to see what can be done. They believe a cigaret or a carelessly thrown match must have caused the fire. There was no electricity in the building. Fire extinguishers had been installed and it was thought every step had been taken to avoid a conflagration.